The first wave of early decision applications shows an 11 percent increase for Emory University's Class of 2021. The 1,595 applications for Emory College and Oxford College include 610 students who applied to both. The first wave of early decision applications from high school students who want to attend Emory University shows an 11 percent increase for the Class of 2021. The 1,595 Early Decision 1 (ED1) applications for Emory College of Arts and Sciences and Oxford College include 610 students who applied to both. That is the largest number of students applying through the first round of early decision in Emory's history; these are students who know they want to attend Emory University and are committed to enrolling if admitted. Emory University offers two points of entry to an undergraduate degree, Emory College and Oxford College. The increase in interest applies to both; Oxford College had a whopping 53 percent increase from last year, to 712 applications, while Emory College saw a nine percent increase to 1,493. The Oxford jump was due in part to an increase in dual applications for both colleges, totaling 610 applications. More than just an increase in numbers, Oxford Dean of Enrollment Services Kelley Lips says the college saw clear enthusiasm from students who want to start their undergraduate education on Emory's original campus in Oxford, Ga.
“We continue to see palpable momentum and enthusiasm for our educational programs, and there is every indication that this will continue to be another record-breaking year for Oxford,” Lips says. The total ED1 applicant pool included an increase of students from New England, the West Coast and living abroad. About 41 percent of applicants were international students. The admit rates for ED1 show the strength of the applicant pool. Some 474 applicants were admitted to Emory College. Another 190 students were accepted into Oxford College; 61 applicants were admitted to both Emory College and Oxford College. The percentage of applicants offered admission declined somewhat this year, and “that lower admit rate is driven by a stronger applicant pool and signals that the applicant pool yet to come in will be large,” Latting says. Emory University has now selected about a third of the Class of 2021, expected to include about 1,350 students at Emory College and 500 at Oxford. Students continue to be drawn to the academic rigor, research opportunities and life outside the classroom at the university. 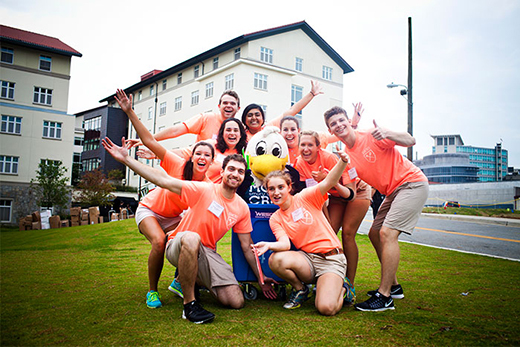 Emory University’s rank as one of the top national universities — 20th in the new 2017 Best Colleges guidebook from U.S. News & World Report and 17th by The Wall Street Journal and Times Higher Education — also helped attract students from beyond the Southeast. The deadline for the second round of early decision and for regular decision is Jan. 1, 2017. Early Decision II notifications will be released on Feb. 15, and regular decision by April 1.